The Norwegian Nobel Committee each year awards the Nobel Peace Prize (Norwegian and Swedish: Nobels fredspris) "to the person who shall have done the most or the best work for fraternity between nations, for the abolition or reduction of standing armies and for the holding and promotion of peace congresses". 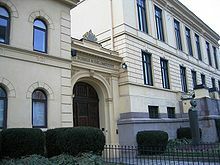 As dictated by Nobel's will, the award is administered by the Norwegian Nobel Committee and awarded by a committee of five people elected by the Parliament of Norway. Each recipient receives a medal, a diploma, and a monetary award prize (that has varied throughout the years). It is one of the five prizes established by the 1895 will of Alfred Nobel (who died in 1896), awarded for outstanding contributions in chemistry, physics, literature, peace, and physiology or medicine. The Peace Prize is presented annually in Oslo, in the presence of the King of Norway, on December 10, the anniversary of Nobel's death, and is the only Nobel Prize not presented in Stockholm. Unlike the other prizes, the Peace Prize is occasionally awarded to an organisation (such as the International Committee of the Red Cross, a three-time recipient) rather than an individual. Linus Pauling, the Nobel Peace Prize laureate in 1962, is the only person to have been awarded two unshared Nobel Prizes; he won the Nobel Prize in Chemistry in 1954. Despite having been nominated five times, Mohandas Karamchand Gandhi never won the Prize. Following his assassination in 1948, the committee considered awarding it to him posthumously but decided against it — and, instead, withheld the Prize that year with the explanation that "there was no suitable living candidate." In 1961, Dag Hammarskjöld, who died after his nomination but several months before the announcement, became the only laureate to be recognised posthumously; following this, the statutes were changed to render a future posthumous prize nearly impossible. In 1973, Le Duc Tho declined the Prize, because "he was not in a position to accept the Prize, citing the situation in Vietnam as his reason." As of 2018[update], the Peace Prize has been awarded to 106 individuals and 24 organizations. Seventeen women have won the Nobel Peace Prize, more than any other Nobel Prize. Only two recipients have won multiple Prizes: the International Committee of the Red Cross has won three times (1917, 1944 and 1963) and the Office of the United Nations High Commissioner for Refugees has won twice (1954 and 1981). There have been 19 years since its creation in which the Peace Prize was not awarded, more times than any other Nobel Prize. Lê Đức Thọ is the only person to refuse to accept a Nobel Peace Prize. He was jointly awarded the 1973 award with Henry Kissinger but declined the prize on grounds that such "bourgeois sentimentalities" were not for him and that the Paris Peace Accords were not being adhered to in full. France "[For] being one of the main founders of the Inter-Parliamentary Union and also the main organizer of the first Universal Peace Congress"
Switzerland "[For his role as] the first honorary secretary of the International Peace Bureau"
United Kingdom "[For his role as] the 'first father' of the Inter-Parliamentary Union"
Belgium "[F]or its efforts as an unofficial body to formulate the general principles of the science of international law"
United States "[For] his successful mediation to end the Russo-Japanese war and for his interest in arbitration, having provided the Hague arbitration court with its very first case"
Italy "[For his work as a] key leader of the Italian peace movement"
France "[For his work as a] leading French international jurist and a member of the Permanent Court of Arbitration at The Hague"
Sweden "[For his work as] founder of the Swedish Peace and Arbitration League"
Denmark "[For being] the foremost peace advocate in Scandinavia, combining work in the Inter-Parliamentary Union with being the first president of the International Peace Bureau"
Belgium "[For being a] representative to the two Hague conferences, and a leading figure in the Inter-Parliamentary Union"
France "[For] combined diplomatic work for Franco-German and Franco-British understanding with a distinguished career in international arbitration"
Switzerland "[For acting] as a link between the peace societies of the various countries"
Netherlands "[For being a] member of the Court of Arbitration as well as the initiator of the Conferences on International Private Law"
Austria-Hungary "[For his work as] founder of the German Peace Society"
United States "[F]or his strong interest in international arbitration and for his plan for a world court"
Belgium "[For his work as] head of the International Peace Bureau"
1914 Not awarded due to World War I.
Switzerland "[For undertaking] the tremendous task of trying to protect the rights of the many prisoners of war on all sides [of World War I], including their right to establish contacts with their families"
1918 Not awarded due to World War I. United States "[F]or his crucial role in establishing the League of Nations"
France "[For his participation] in both the Hague Conferences of 1899 and 1907" and for his work towards "what became the League to such an extent that he was frequently called its 'spiritual father'"
Sweden "[F]or his work in the League of Nations"
Norway "[For his work as] the first secretary of the Norwegian Nobel Committee" and "the secretary-general of the Inter-Parliamentary Union"
Fridtjof Nansen "[For] his work in aiding the millions in Russia struggling against famine" and "his work for the refugees in Asia Minor and Thrace"
United States "[F]or [work on] the Dawes Plan for German reparations which was seen as having provided the economic underpinning of the Locarno Pact of 1925"
France "[For] contributions to Franco-German popular reconciliation"
United States "[F]or the Kellogg-Briand pact, whose signatories agreed to settle all conflicts by peaceful means and renounced war as an instrument of national policy"
Sweden "[F]or his efforts to involve the churches not only in work for ecumenical unity, but also for world peace"
United States "[F]or her social reform work" and "leading the Women's International League for Peace and Freedom"
United Kingdom For authoring The Great Illusion and for being a "supporter of the League of Nations as well as an influential publicist [and] educator for peace in general"
Arthur Henderson "[F]or his work for the League, particularly its efforts in disarmament"
Germany "[For his] struggle against Germany's rearmament"
Argentina "[F]or his mediation of an end to the Chaco War between Paraguay and Bolivia"
1939 Not awarded due to World War II. Switzerland "[F]or the great work it has performed during the war in behalf of humanity"
United States "[For] his fight against isolationism at home, his efforts to create a peace bloc of states on the American continents, and his work for the United Nations Organization"
Emily Greene Balch "Formerly Professor of History and Sociology; Honorary International President, Women's International League for Peace and Freedom"
The Quakers (represented by Friends Service Council and American Friends Service Committee) "compassion for others and the desire to help them"
United Kingdom "Physician; Alimentary Politician; Prominent organizer and Director, General Food and Agriculture Organization; President, National Peace Council and World Union of Peace Organizations"
United States "Professor, Harvard University Cambridge, MA; Director, division of Trusteeship, U.N.; Acting Mediator in Palestine, 1948"
France "President of the International Committee of the European Council, vice president of the International Confederation of Free Trade Unions, vice president of the World Federation of Trade Unions, member of the ILO Council, delegate to the United Nations"
Albert Schweitzer "Missionary surgeon; Founder of Lambaréné (République de Gabon)"
United States "General President American Red Cross; Former Secretary of State and of Defense; Delegate U.N.; Originator of [the] 'Marshall Plan'"
United Nations "An international relief organization founded by the U.N. in 1951"
Canada "former Secretary of State for External Affairs of Canada; former President of the 7th Session of the United Nations General Assembly"; "for his role in helping to end the Suez conflict and trying to solve the Middle East question through the United Nations." Belgium "Father in the Dominican Order; Leader of the relief organization for refugees "L'Europe du Coeur au Service du Monde""
United Kingdom "Member of Parliament; lifelong ardent worker for international peace and co-operation"
(Born in Southern Rhodesia) "President of the African National Congress," "was in the very forefront of the struggle against apartheid in South Africa." Sweden "Secretary General of the U.N.," awarded "for strengthening the organization." United States "for his campaign against nuclear weapons testing"
Switzerland For their work in the protection of human rights in the ICRC's 100 years of existence. United States Campaigner for civil rights, "first person in the Western world to have shown us that a struggle can be waged without violence." King spent his time working in various areas of the civil rights movement; from equal education to economic disenfranchisement of minorities. King also organized the March on Washington, where he gave his famous “I Have a Dream Speech”. France "President of the European Court for Human Rights"
United States "International Maize and Wheat Improvement Center;" "for his contributions to the "green revolution" that was having such an impact on food production particularly in Asia and in Latin America." West Germany "Chancellor of the Federal Republic of Germany; for West Germany's Ostpolitik"
Germany) "For the 1973 Paris agreement intended to bring about a cease-fire in the Vietnam war and a withdrawal of the American forces"
France) "President of the International Peace Bureau; President of the Commission of Namibia." "For his strong interest in human rights: piloting the European Convention on Human Rights through the Council of Europe, helping found and then lead Amnesty International and serving as secretary-general of the International Commission of Jurists"
Japan "Prime Minister of Japan," "for his renunciation of the nuclear option for Japan and his efforts to further regional reconciliation"
Soviet Union "[for his] struggle for human rights, for disarmament, and for cooperation between all nations"
United Kingdom "Founder[s] of the Northern Ireland Peace Movement (later renamed Community of Peace People)"
1977 Amnesty International "[for] protecting the human rights of prisoners of conscience"
Egypt "for the Camp David Agreement, which brought about a negotiated peace between Egypt and Israel"
North Macedonia) "Founder of Missionaries of Charity"
Argentina "Human rights leader;" "founded non-violent human rights organizations to fight the military junta that was ruling his country (Argentina)." Sweden "[for] their magnificent work in the disarmament negotiations of the United Nations, where they have both played crucial roles and won international recognition"
Poland "Founder of Solidarność; campaigner for human rights"
South Africa "... as a unifying leader figure in the campaign to resolve the problem of apartheid in South Africa. ... Through the award of this year's Peace Prize, the Committee wishes to direct attention to the non-violent struggle for liberation to which Desmond Tutu belongs, a struggle in which black and white South Africans unite to bring their country out of conflict and crisis." United States For "authoritative information and by creating an awareness of the catastrophic consequences of atomic warfare. The committee believes that this in turn contributes to an increase in the pressure of public opposition to the proliferation of atomic weapons and to a redefining of priorities, with greater attention being paid to health and other humanitarian issues." Romania) "Chairman of "The President's Commission on the Holocaust""
Costa Rica "for his work for peace in Central America, efforts which led to the accord signed in Guatemala on August 7 this year"
United Nations "[for] their efforts [that] have made important contributions towards the realization of one of the fundamental tenets of the United Nations"
Tibet) "In his struggle for the liberation of Tibet [he] consistently has opposed the use of violence. He has instead advocated peaceful solutions based upon tolerance and mutual respect in order to preserve the historical and cultural heritage of his people." Soviet Union General Secretary of the Communist Party of the Soviet Union and President of the Soviet Union, "for his leading role in the peace process which today characterizes important parts of the international community"
Burma "for her non-violent struggle for democracy and human rights"
Guatemala "for her work for social justice and ethno-cultural reconciliation based on respect for the rights of indigenous peoples"
South Africa "for their work for the peaceful termination of the apartheid regime, and for laying the foundations for a new democratic South Africa"
Egypt) "to honour a political act which called for great courage on both sides, and which has opened up opportunities for a new development towards fraternity in the Middle East." Poland "for their efforts to diminish the part played by nuclear arms in international politics and, in the longer run, to eliminate such arms"
Switzerland "for their work for the banning and clearing of anti-personnel mines"
Ireland "for their efforts to find a peaceful solution to the conflict in Northern Ireland"
Switzerland "in recognition of the organization's pioneering humanitarian work on several continents"
South Korea "for his work for democracy and human rights in South Korea and in East Asia in general, and for peace and reconciliation with North Korea in particular"
United Nations "for their work for a better organized and more peaceful world"
United States "for his decades of untiring effort to find peaceful solutions to international conflicts, to advance democracy and human rights, and to promote economic and social development"
Kenya "for her contribution to sustainable development, democracy and peace"
United Nations "for their efforts to prevent nuclear energy from being used for military purposes and to ensure that nuclear energy for peaceful purposes is used in the safest possible way"
Bangladesh "for advancing economic and social opportunities for the poor, especially women, through their pioneering microcredit work"
United Nations "for their efforts to build up and disseminate greater knowledge about man-made climate change, and to lay the foundations for the measures that are needed to counteract such change"
Finland "for his efforts on several continents and over more than three decades, to resolve international conflicts"
United States "for his extraordinary efforts to strengthen international diplomacy and cooperation between peoples." China "for his long and non-violent struggle for fundamental human rights in China"
Liberia "for their non-violent struggle for the safety of women and for women's rights to full participation in peace-building work"
European Union "for over six decades contributed to the advancement of peace and reconciliation, democracy and human rights in Europe." Netherlands "for its extensive efforts to eliminate chemical weapons." India "for their struggle against the suppression of children and young people and for the right of all children to education"
Tunisia "for its decisive contribution to the building of a pluralistic democracy in Tunisia in the wake of the Jasmine Revolution of 2011"
Colombia "for his resolute efforts to bring the country's more than 50-year-long civil war to an end, a war that has cost the lives of at least 220,000 Colombians and displaced close to six million people"
Switzerland "for its work to draw attention to the catastrophic humanitarian consequences of any use of nuclear weapons and for its ground-breaking efforts to achieve a treaty-based prohibition of such weapons". Democratic Republic of the Congo "for their efforts to end the use of sexual violence as a weapon of war and armed conflict"
^ "Excerpt from the Will of Alfred Nobel". Nobel Foundation. Archived from the original on 2013-05-30. Retrieved 2011-10-06. ^ "Prize Awarder for the Nobel Peace Prize". Nobel Foundation. Retrieved 2011-10-06. ^ "The Nobel Prize". Nobel Foundation. Retrieved 2011-10-06. ^ "Alfred Nobel: The Man Behind the Nobel Prize". Nobel Foundation. Retrieved 2011-10-06. ^ "The Nobel Peace Prize Award Ceremonies". Nobel Foundation. Retrieved 2011-10-06. ^ a b c "Nobel Laureates Facts". Nobel Foundation. Archived from the original on 2012-09-01. Retrieved 2011-10-06. ^ Tønnesson, Øyvind (2000-06-29). "Controversies and Criticisms". Nobel Foundation. Retrieved 2011-10-06. ^ Murphy, Clare (2000-10-08). "The Nobel: Dynamite or damp squib?". BBC News. Retrieved 2011-10-06. ^ a b Tønnesson, Øyvind (1999-12-01). "Controversies Mahatma Gandhi, the Missing Laureate". Nobel Foundation. Retrieved 2011-10-06. ^ a b c d e f g h i j k l m n o p q r s t u v w x y z aa ab ac ad ae af ag ah ai aj ak al am an ao ap aq ar as Lundestad, Geir (2001-03-15). "The Nobel Peace Prize, 1901–2000". Nobel Foundation. Retrieved 2011-10-06. ^ a b "The Nobel Peace Prize 1901". Nobel Foundation. Retrieved 2011-10-06. ^ a b "The Nobel Peace Prize 1902". Nobel Foundation. Retrieved 2011-10-06. ^ "The Nobel Peace Prize 1903". Nobel Foundation. Retrieved 2011-10-06. ^ "The Nobel Peace Prize 1904". Nobel Foundation. Retrieved 2011-10-06. ^ "The Nobel Peace Prize 1905". Nobel Foundation. Retrieved 2011-10-06. ^ "The Nobel Peace Prize 1906". Nobel Foundation. Retrieved 2011-10-06. ^ a b "The Nobel Peace Prize 1907". Nobel Foundation. Retrieved 2011-10-06. ^ a b "The Nobel Peace Prize 1908". Nobel Foundation. Retrieved 2011-10-06. ^ a b "The Nobel Peace Prize 1909". Nobel Foundation. Retrieved 2011-10-06. ^ "Award Ceremony Speech (1910)". Nobel Foundation. Retrieved 2011-10-06. ^ "The Nobel Peace Prize 1910". Nobel Foundation. Retrieved 2011-10-06. ^ a b "The Nobel Peace Prize 1911". Nobel Foundation. Retrieved 2011-10-06. ^ a b "The Nobel Peace Prize 1912". Nobel Foundation. Retrieved 2011-10-06. ^ "The Nobel Peace Prize 1913". Nobel Foundation. Retrieved 2011-10-06. ^ "The Nobel Peace Prize 1917". Nobel Foundation. Retrieved 2011-10-06. ^ "The Nobel Peace Prize 1920". Nobel Foundation. Retrieved 2011-10-06. ^ a b "The Nobel Peace Prize 1921". Nobel Foundation. Retrieved 2011-10-06. ^ Stang, Fredrik. "Award Ceremony Speech (1922)". Nobel Foundation. Retrieved 2011-10-10. ^ "The Nobel Peace Prize 1922". Nobel Foundation. Retrieved 2011-10-06. ^ a b c "The Nobel Peace Prize 1925". Nobel Foundation. Retrieved 2011-10-06. ^ "The Nobel Peace Prize 1926". Nobel Foundation. Retrieved 2011-10-06. ^ "The Nobel Peace Prize 1927". Nobel Foundation. Retrieved 2011-10-06. ^ a b "The Nobel Peace Prize 1929". Nobel Foundation. Retrieved 2011-10-06. ^ "The Nobel Peace Prize 1930". Nobel Foundation. Retrieved 2011-10-06. ^ a b "The Nobel Peace Prize 1931". Nobel Foundation. Retrieved 2011-10-06. ^ a b "The Nobel Peace Prize 1933". Nobel Foundation. Retrieved 2011-10-06. ^ "The Nobel Peace Prize 1934". Nobel Foundation. Retrieved 2011-10-06. ^ "The Nobel Peace Prize 1935". Nobel Foundation. Retrieved 2011-10-06. ^ "The Nobel Peace Prize 1936". Nobel Foundation. Retrieved 2011-10-06. ^ "The Nobel Peace Prize 1937". Nobel Foundation. Retrieved 2011-10-06. ^ Stang, Fredrik. "Award Ceremony Speech (1938)". Nobel Foundation. Retrieved 2011-10-06. ^ Jahn, Gunnar. "Award Ceremony Speech (1944)". Nobel Foundation. Retrieved 2011-10-06. ^ Jahn, Gunnar. "Award Ceremony Speech (1945)". Nobel Foundation. Retrieved 2011-10-06. ^ a b "The Nobel Peace Prize 1946". Nobel Foundation. Retrieved 2008-11-12. ^ a b Jahn, Gunnar. "Award Ceremony Speech (1947)". Nobel Foundation. Retrieved 2011-10-06. ^ Abrams, Irwin (1991). "The Quaker Peace Testimony and the Nobel Peace Prize". Retrieved 2018-11-24. ^ "The Nobel Peace Prize 1949". Nobel Foundation. Retrieved 2008-11-12. ^ "The Nobel Peace Prize 1950". Nobel Foundation. Retrieved 2008-11-12. ^ "The Nobel Peace Prize 1951". Nobel Foundation. Retrieved 2008-11-12. ^ "The Nobel Peace Prize 1952". Nobel Foundation. Retrieved 2008-11-12. ^ "The Nobel Peace Prize 1953". Nobel Foundation. Retrieved 2008-11-12. ^ "The Nobel Peace Prize 1954". Nobel Foundation. Retrieved 2008-11-12. ^ "The Nobel Peace Prize 1957". Nobel Foundation. Retrieved 2008-11-12. ^ "The Nobel Peace Prize 1958". Nobel Foundation. Retrieved 2008-11-12. ^ "The Nobel Peace Prize 1959". Nobel Foundation. Retrieved 2008-11-12. ^ "The Nobel Peace Prize 1960". Nobel Foundation. Retrieved 2008-11-12. ^ "The Nobel Peace Prize 1961". Nobel Foundation. Retrieved 2008-11-12. ^ "The Nobel Peace Prize 1962". Nobel Foundation. Retrieved 2008-11-12. ^ "The Nobel Peace Prize 1963". Nobel Foundation. Retrieved 2008-11-12. ^ "The Nobel Peace Prize 1964". Nobel Foundation. Retrieved 2008-11-12. ^ "The Nobel Peace Prize 1965". Nobel Foundation. Retrieved 2008-11-12. ^ "The Nobel Peace Prize 1968". Nobel Foundation. Retrieved 2008-11-12. ^ "The Nobel Peace Prize 1969". Nobel Foundation. Retrieved 2008-11-12. ^ "The Nobel Peace Prize 1970". Nobel Foundation. Retrieved 2008-11-12. ^ "The Nobel Peace Prize 1971". Nobel Foundation. Retrieved 2008-11-12. ^ a b "The Nobel Peace Prize 1973". Nobel Foundation. Retrieved 2008-11-12. ^ a b "The Nobel Peace Prize 1974". Nobel Foundation. Retrieved 2008-11-12. ^ "The Nobel Peace Prize 1975". Nobel Foundation. Retrieved 2008-11-12. ^ "The Nobel Peace Prize 1976". Nobel Foundation. Retrieved 2008-11-12. ^ "The Nobel Peace Prize 1977". Nobel Foundation. Retrieved 2008-11-12. ^ "The Nobel Peace Prize 1978". Nobel Foundation. Retrieved 2008-11-12. ^ "The Nobel Peace Prize 1979". Nobel Foundation. Archived from the original on 2014-10-16. Retrieved 2008-11-12. ^ "The Nobel Peace Prize 1980". Nobel Foundation. Retrieved 2008-11-12. ^ "The Nobel Peace Prize 1981". Nobel Foundation. Retrieved 2008-11-12. ^ "The Nobel Peace Prize 1982". Nobel Foundation. Retrieved 2008-11-12. ^ "The Nobel Peace Prize 1982–Presentation Speech". Nobel Foundation. Retrieved 2008-12-03. ^ "The Nobel Peace Prize 1983". Nobel Foundation. Retrieved 2008-11-12. ^ "The Nobel Peace Prize for 1984". Nobel Foundation. Retrieved 2018-05-11. ^ "The Nobel Peace Prize 1985". Nobel Foundation. Retrieved 2008-11-12. ^ "The Nobel Peace Prize 1986". Nobel Foundation. Retrieved 2008-11-12. ^ "The Nobel Peace Prize 1987". Nobel Foundation. Retrieved 2008-10-20. ^ "The Nobel Peace Prize 1988". Nobel Foundation. Retrieved 2008-11-12. ^ "The Nobel Peace Prize 1988–Press release". Nobel Foundation. 1988-09-29. Retrieved 2008-11-28. ^ "Questions and answers on the Nobel Peace Prize - NobelPrize.org". NobelPrize.org. ^ "The Nobel Peace Prize 1989". Nobel Foundation. Retrieved 2008-11-12. ^ "The Nobel Peace Prize 1989–Press release". Nobel Foundation. 1989-10-05. Retrieved 2008-11-28. ^ "The Nobel Peace Prize 1990". Nobel Foundation. Retrieved 2008-10-20. ^ "The Nobel Peace Prize 1991". Nobel Foundation. Retrieved 2008-10-20. ^ "The Nobel Peace Prize 1992". Nobel Foundation. Retrieved 2008-10-20. ^ "The Nobel Peace Prize 1993". Nobel Foundation. Archived from the original on 2014-10-16. Retrieved 2008-10-20. ^ "Press Release- The Nobel Peace Prize 1994". Nobel Foundation. Retrieved 2008-10-20. ^ "The Nobel Peace Prize 1995". Nobel Foundation. Retrieved 2008-10-20. ^ "The Nobel Peace Prize 1996". Nobel Foundation. Retrieved 2008-10-20. ^ "The Nobel Peace Prize 1997". Nobel Foundation. Retrieved 2008-10-20. ^ "The Nobel Peace Prize 1998". Nobel Foundation. Retrieved 2008-10-20. ^ "The Nobel Peace Prize 1999". Nobel Foundation. Retrieved 2018-08-21. ^ "The Nobel Peace Prize 2000". Nobel Foundation. Retrieved 2008-10-20. ^ "The Nobel Peace Prize 2001". Nobel Foundation. Retrieved 2008-10-20. ^ "The Nobel Peace Prize 2002". Nobel Foundation. Retrieved 2008-10-20. ^ "The Nobel Peace Prize 2003". Nobel Foundation. Retrieved 2008-10-20. ^ "The Nobel Peace Prize 2004". Nobel Foundation. Retrieved 2008-10-20. ^ "The Nobel Peace Prize 2005". Nobel Foundation. Retrieved 2008-10-20. ^ "The Nobel Peace Prize 2006". Nobel Foundation. Retrieved 2008-10-20. ^ "The Nobel Peace Prize 2007". Nobel Foundation. Retrieved 2008-10-20. ^ "The Nobel Peace Prize 2008". Nobel Foundation. Retrieved 2008-10-10. ^ "The Nobel Peace Prize 2009". Nobel Foundation. Retrieved 2009-10-09. ^ "The Nobel Peace Prize 2010". Nobel Foundation. Archived from the original on 2011-12-02. Retrieved 2010-10-08. ^ "The Nobel Peace Prize 2012". Nobel Foundation. Retrieved 12 October 2012. ^ "The Nobel Peace Prize 2013" (PDF). Nobel Foundation. Archived from the original (PDF) on 2013-10-11. Retrieved 2013-10-11. ^ "The Nobel Peace Prize 2015". Nobel Foundation. Retrieved 2015-10-09. ^ "The Nobel Peace Prize 2016". Nobel Foundation. Retrieved 2016-10-07. ^ "The Nobel Peace Prize 2017 - Press Release". www.nobelprize.org. Retrieved 2017-10-06. ^ "The Nobel Peace Prize 2018 - Press Release". www.nobelprize.org. Retrieved 2018-10-05. ^ "Biography: Carl von Ossietzky". Nobel Foundation. Retrieved 2011-10-06. ^ Lionaes, Aase. "Award Ceremony Speech (1975)". Nobel Foundation. Retrieved 2011-10-06. ^ Sejersted, Francis. "Award Ceremony Speech (1991)". Nobel Foundation. Retrieved 2011-10-06. ^ Jagland, Thorbjørn. "Award Ceremony Speech (2010)". Nobel Foundation. Retrieved 2011-10-06. "Winners of the Nobel Prize for Peace". Encyclopædia Britannica. Retrieved 2008-11-29.